Hanalei Bay is one of my favorite beaches in Kauai. I have so many fond memories of that place. It was my 'go to' beach while we lived there because of the calm waters, wide sand area and the fact that I could just park the car on the beach and not have to carry our beach stuff and the kids far at all. We spent one evening there after visiting some other North Shore beaches and got to see a beautiful Hawaii sunset from the pier. 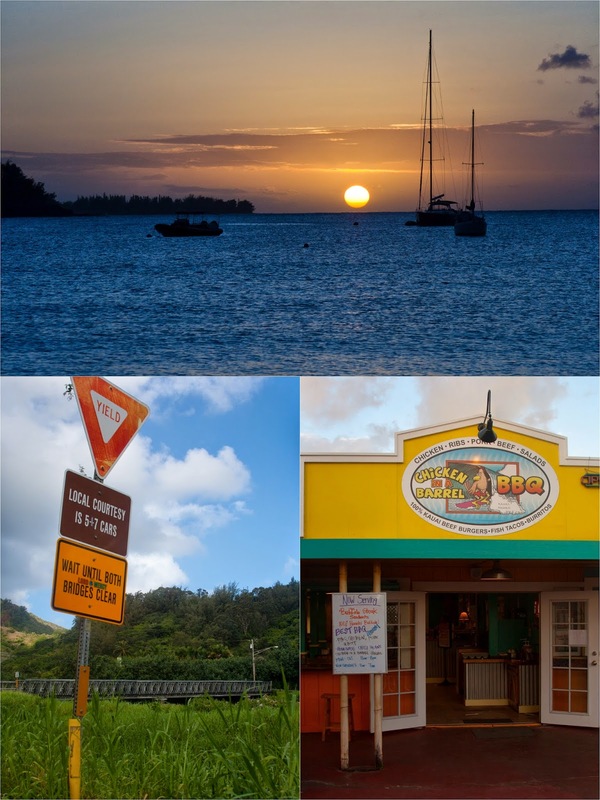 We tried several eating establishments while on the island. Todd's favorite was Chicken in a Barrel BBQ in Hanalei. It reminds me of Dickey's BBQ. The BBQ chicken was really tasty. While we were sitting outside enjoying our food I noticed a young Hawaiian meandering the shopping center where Chicken in a Barrel is located. After our dinner the same young guy was sitting at one of the other outdoor tables proudly and shamelessly zipping up his ziplock bag full of marijuana. He had just finished rolling a joint and was getting ready to smoke it. Todd quickly pulls up his camera and starts taking pictures in the guy's direction. The kid's eyes grew huge and he leaped out of the table, not wanting to be caught on camera smoking weed. The funniest part of all was that Todd was completely unaware of what had just happened. He was just trying to take a photo of a red tropical bird that had landed on the table next to where the guy was sitting. I laughed so hard! !